Everyone always talks about how much Disney park visits cost. And they do, indeed, cost quite a bit. But, there's value all around if you look for it. Most of the time, that value comes from spending quality time with your family. Some other times, that value comes from the little things that you can pick up/get/do around the parks. I've written about these various 'freebies' around the parks here on the blog. Full list is below. Today, is the second day in a row posting about one of these things and they're both transportation-related. 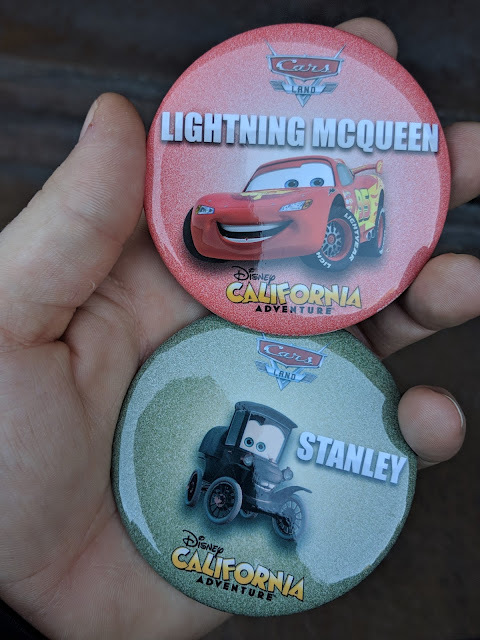 These in the photo at the top are from Disney's California Adventure and are available at Radiator Springs Racers in Carsland. If you ask the cast member, you can choose between Lightning McQueen and Stanley. With three kids, we were able to get both! The kids wore these (the boy on his hat, the girls on their lanyards) all day. Disneyland Resort does NOT do pin trading like they do at Walt Disney World (it is hard to find a Cast Member with a pin lanyard at DLR), but they *do* do buttons like these all over the place. That's kinda nice. This set of Lightning McQueen and Stanley Disney California Adventure buttons. You can ask for a Driver's License from the Tomorrowland Speedway in Walt Disney World. And just yesterday, I posted the companion license from Autopia in Disneyland Resort. You can get the business card that we got from the Mayor of Main Street USA. He's dead now, so I don't think they're doing this any longer. There's also an official 'guest skipper' license from the Jungle Cruise Skippers. 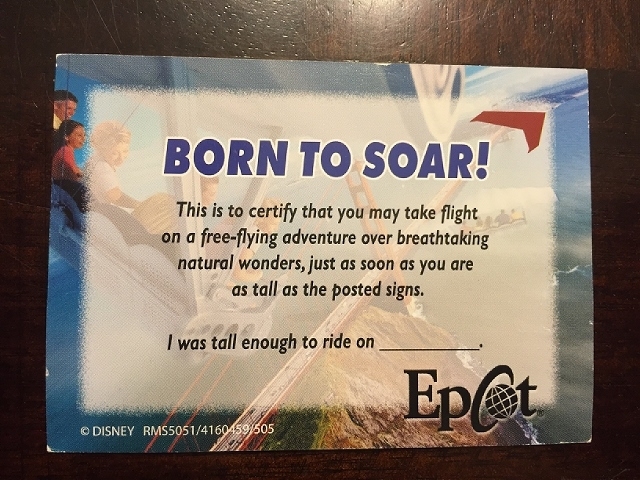 And a card from Soarin' that is labeled "Born to Soar" that allows little ones to 'fly' the ride as soon as they hit the height. If you are an Annual Passholder, they have things all the time for you. Including buttons like this one from the Food and Wine Festival. Or car magnets like this Mickey one from the Flower and Garden Festival. There are also plenty of character stickers from various cast members and DVC kiosks like Minnie Mouse and Mickey Mouse. And you can get a Celebration Pin everyday or special pins on other days like Mickey Mouse's birthday or a special pin if you participate in the Star Wars Jedi Training. Or this "I'm Tweeting" button from @WDWToday. If you look hard enough, you can also find 'job role' stickers like Honorary Custodian or WDW Monorail Pilot. And there's, of course, transportation cards.